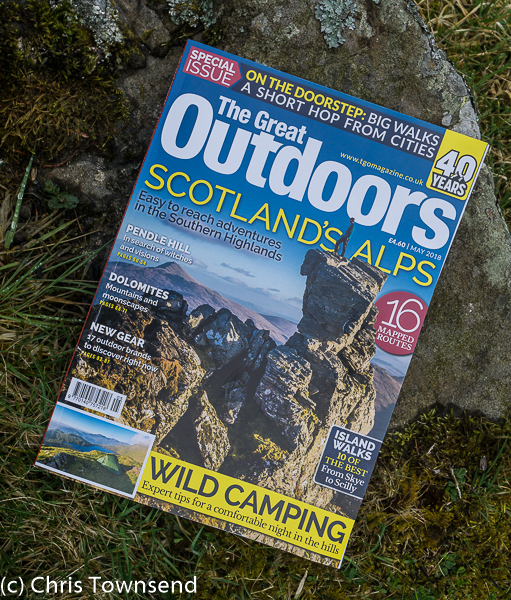 The May issue of The Great Outdoors is in the shops now. 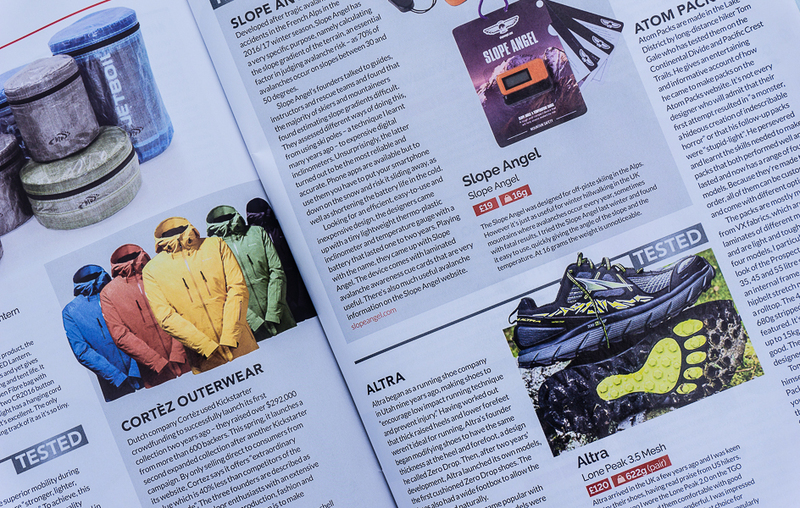 In the gear pages I look at seventeen new outdoor companies offering everything from sleeping bags to solar powered lights, packs and waterproofs, and review the Millican Fraser 32l rucksack. 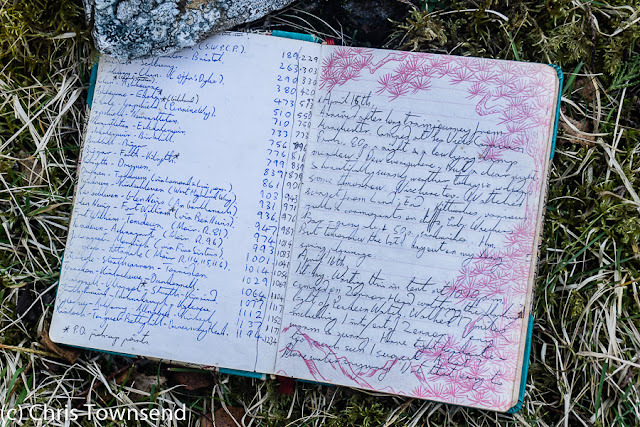 Judy Armstrong looks at technical gear for scrambling. 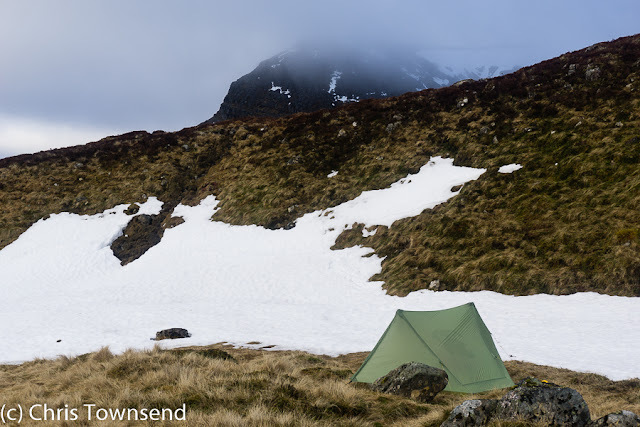 There'a guide to comfortable wild camping in which I cover planning a sleep system and choosing a comfortable site. 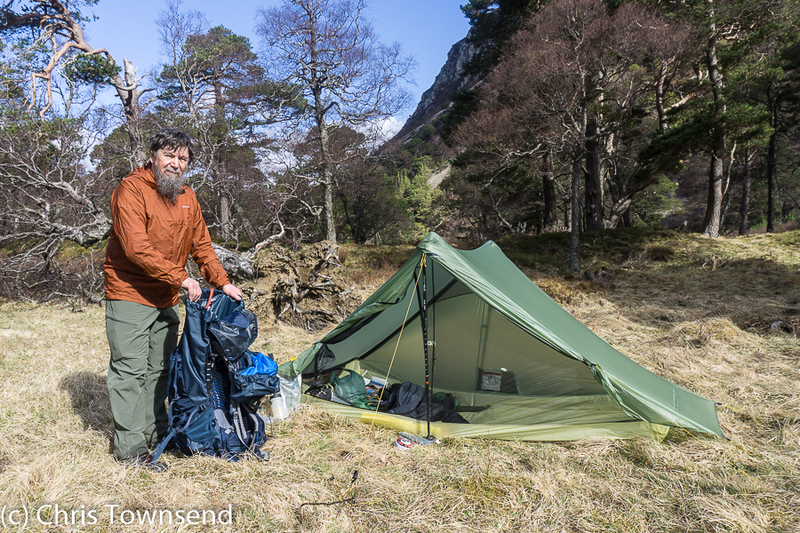 Alex Roddie looks at routines for a comfortable night and what to wear in a sleeping bag and Ronald Turnbull gives suggestions for bivvying. This issue opens with a wonderful mouth-watering photo by David Lintern of a camp on Sgurr na Stri with the snow-covered Cuillin stretched out on the horizon. Ronald Turnbull asks whether the Arrochar Alps are like the actual Alps. 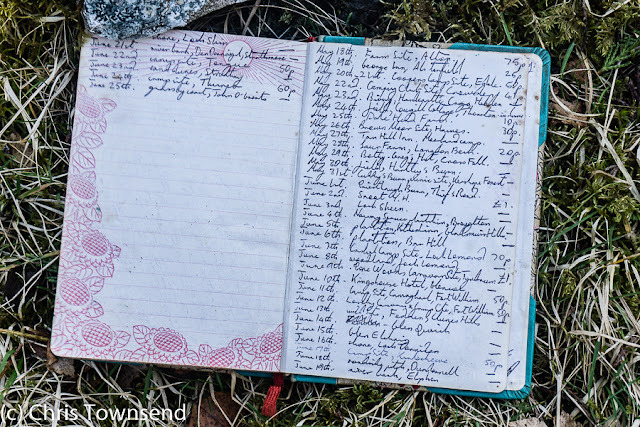 Patrick Kinsella explores limestone scenery along the West Mendip Way. Vivienne Crow goes walking in Northumberland. Steph Cooke looks for walks in the East Midlands. 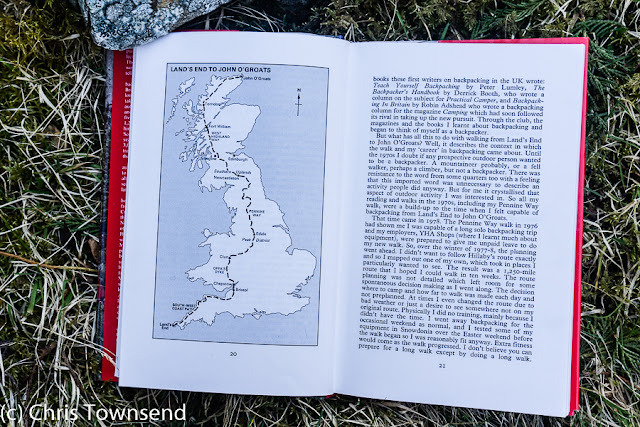 Paul Beasley goes backpacking in East Sussex. Jon Sparks traverses Pendle Hill. Hanna Lindon interviews Everest mountaineer Mollie Hughes. Roger Smith discusses reintroducing lynx into the Highlands, with reference to David Hetherington's book The Lynx and Us. Jim Perrin praises the Malvern Hills. Jack Southern treks the Dolomites. Rivers are one of the delights of wild land, bringing dynamism to forests and hills as they slice through the land, twisting and turning and surging. I love following rivers and streams to see where they go, to see what lies along their banks. They’re particularly wonderful in spate after heavy rain or snowmelt when their power can be both scary and invigorating. 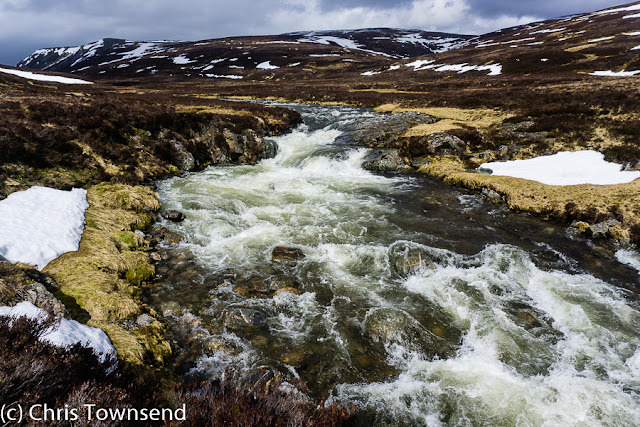 One of my favourite Cairngorm rivers is the Eidart, which is remote and little-known though a key watercourse as it drains the Moine Mhor, that vast plateau on the western side of the range. 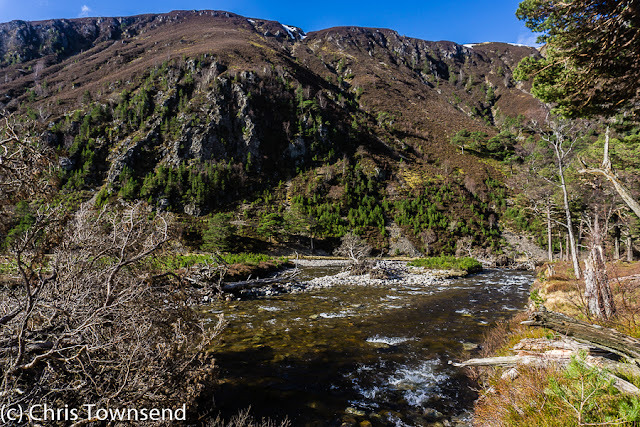 The Eidart almost splits the plateau in two, running from close to the northern edge some ten kilometres down to a confluence with the River Feshie. 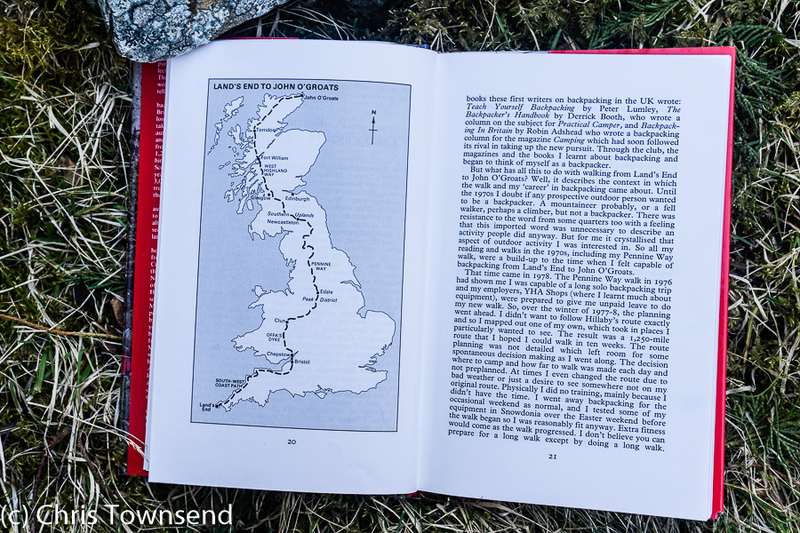 I’ve walked a circuit from Glen Feshie to the Eidart then back to the glen across the Moine Mhor a few times. It’s a superb trip. 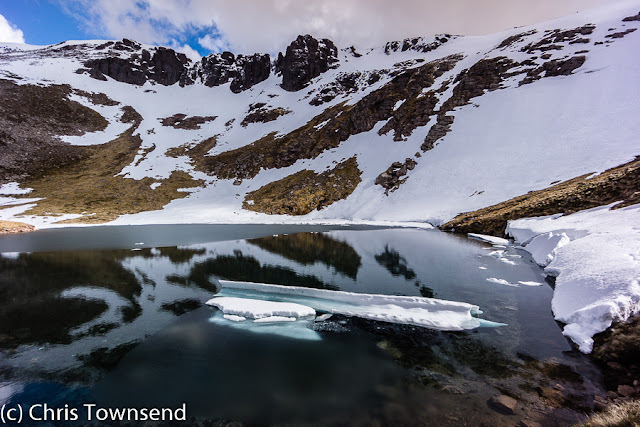 I’d never done it at the height of the snowmelt though so last week as the first really warm weather of the year was stripping the snow almost visibly from the hills I set out. Every stream was rushing furiously and I had several knee deep fords in the first few miles up Glen Feshie. My boots were quickly sodden and stayed that way throughout the trip. 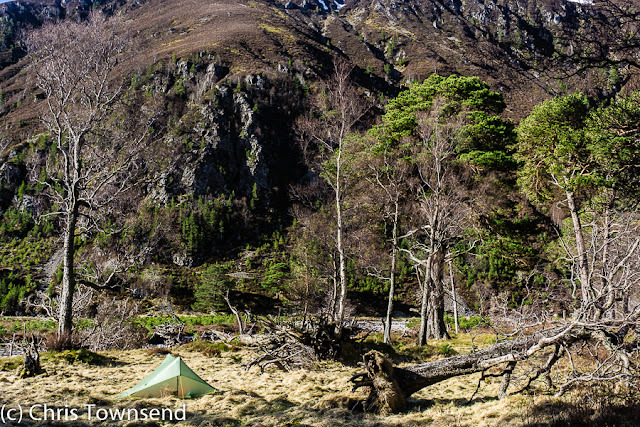 I didn’t go far that first afternoon as I wanted to camp amongst the trees in Glen Feshie for the first time this year. I passed the refurbished bothy at Ruigh-aiteachan thinking it seemed a bit too clean and characterless. I guess the bothy atmosphere will soon return. A couple of miles further up the glen I camped with a view of trees and crags, a lovely wild spot. I had hoped for stars but the sky was overcast. I fell asleep listening to owls hooting. The sky cleared overnight and I woke to a deep blue sky. The sun was on the crags across the river but the glen floor was still in shade and the temperature was near freezing. I went and looked at the Feshie, all white water and roaring. The latter sound would be with me all day even when I couldn’t see the water. The rough path round to the Eidart leads out of the forest and onto open moorland. There are still trees though, hanging onto the steep banks above the river out of reach of deer. 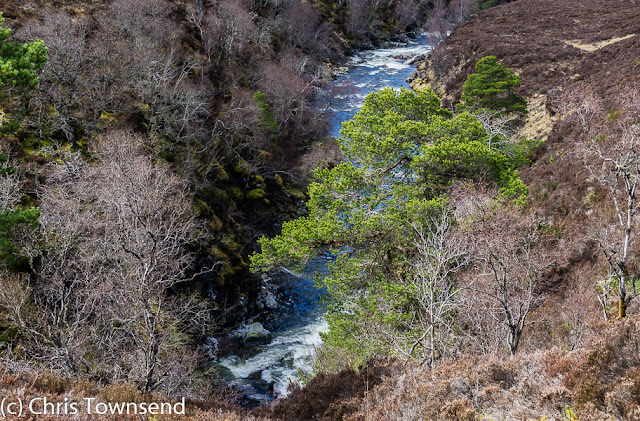 As the forest continues to regenerate and expand in the lower glen hopefully it will start to spread up here. 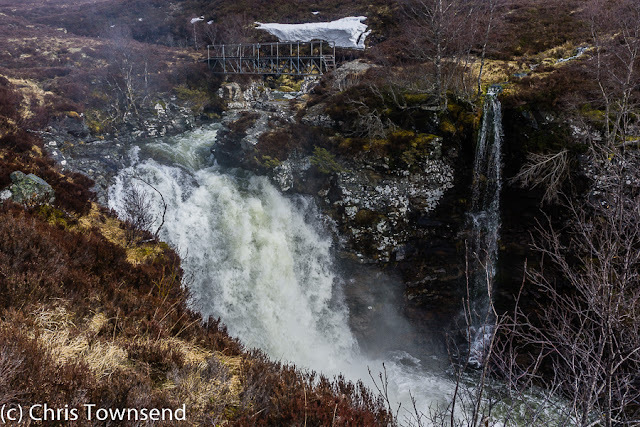 The confluence of the Eidart and Feshie was a clash of white water. Just upstream I could see a cloud of mist rising into the air. As I approached I realised it was spray from the Eidart Falls, crashing down below the Eidart Bridge. I couldn’t remember seeing the waterfall this powerful before. I thought the same about the Eidart as a whole as I continued past a succession of smaller falls, water slides, and rapids. The river was sparkling, alive, boisterous. 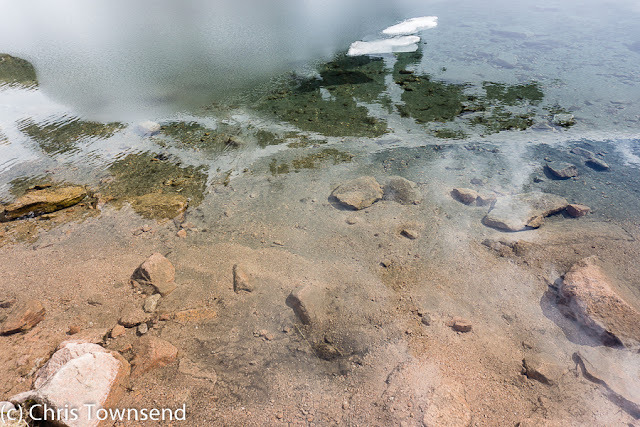 I watched dippers skimming the water, the little birds perfectly at home in the white water. In its upper reaches the Eidart splits into three branches. Previously I’d followed the longest of these, the Allt Sgairnich, which rises on the slopes of Carn Ban Mor on the north side of the Moine Mhor. 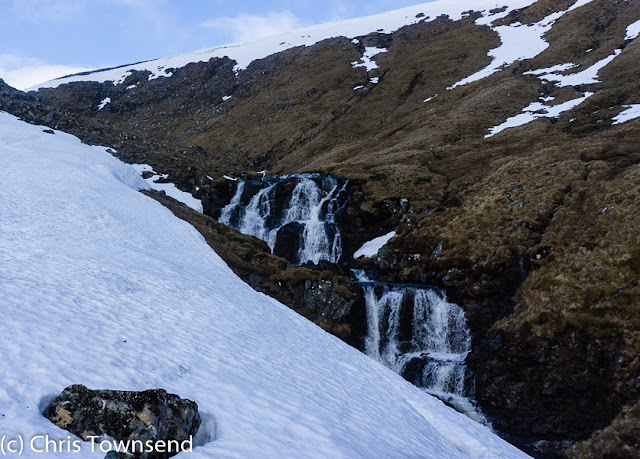 This time I wanted to explore the westernmost branch, the Caochan Dubh, which took a twisting route up a narrow ravine into the heart of the Moine Mhor. That was for the next day though. 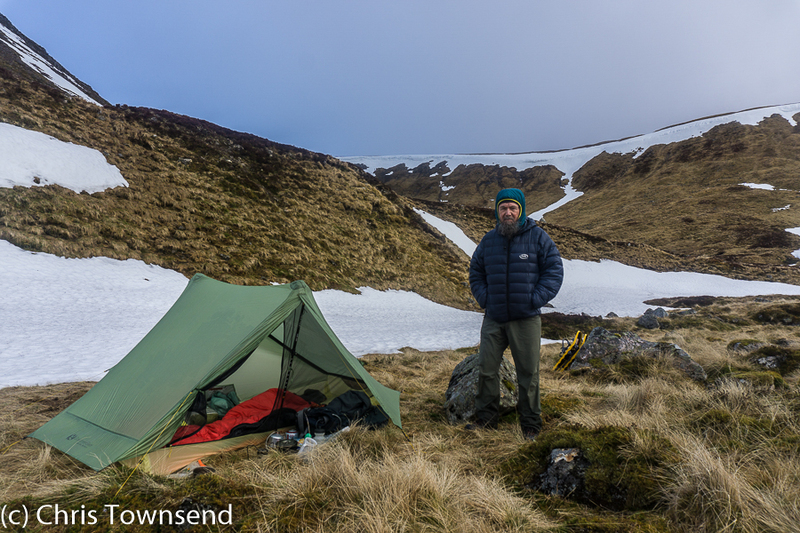 I camped beside big snowbanks not far from the mouth of the Caochan Dubh. The sky had clouded over during the day and rain started just as I finished pitching the tent. It continued hard and sharp, its drumming on the nylon waking me during the night. The storm had passed by dawn, though the sky still looked angry, with dark clouds racing overhead. 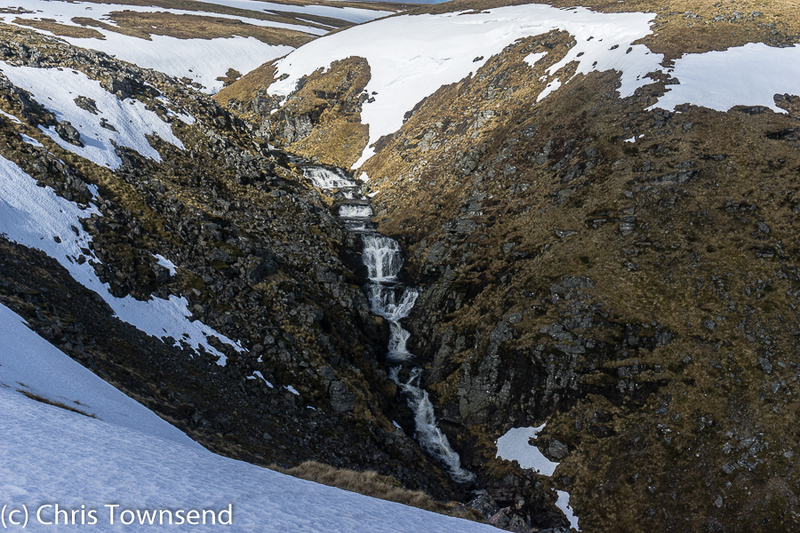 The Caochan Dubh ravine was rocky and there were big banks of hard icy snow. 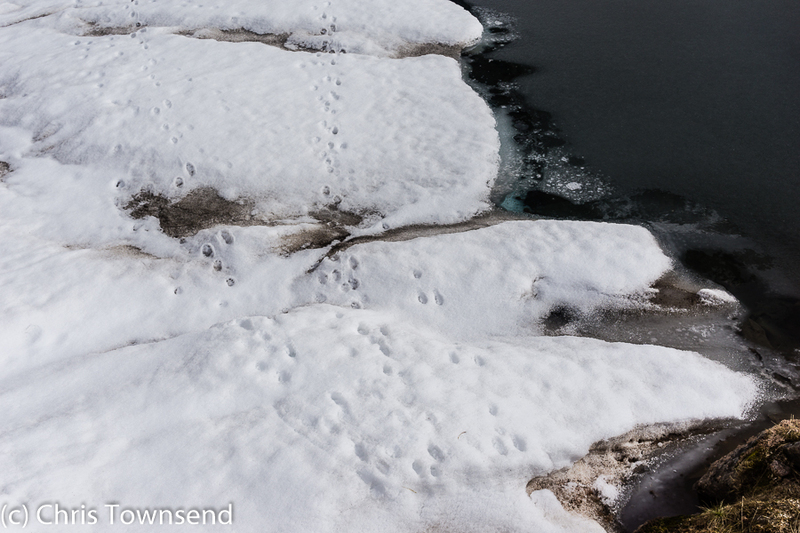 Eventually, as it grew steeper, I decided to clamber up the side onto flatter ground. 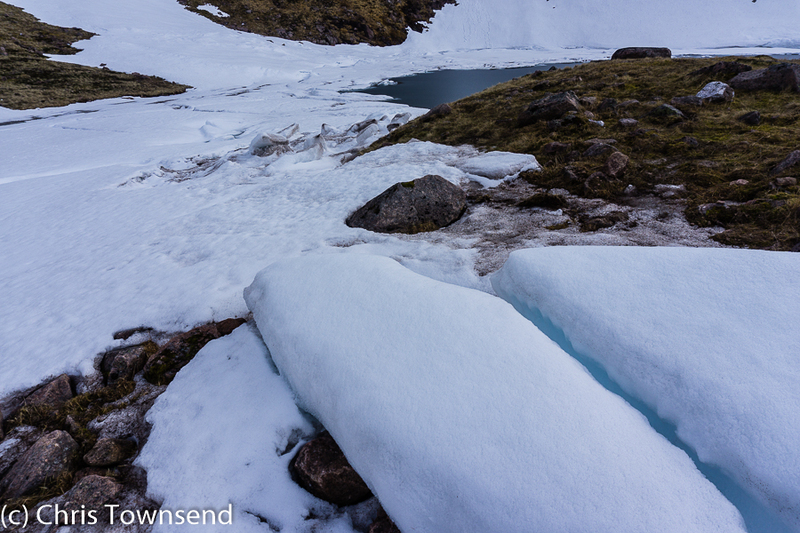 This brought me, unintentionally, to a superb viewpoint, a little knoll at the end of the northern arm of Coire Mharconaich. 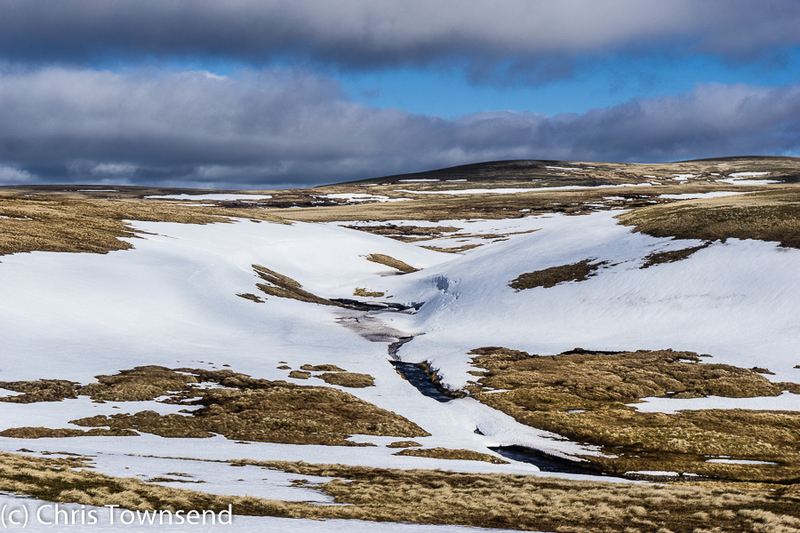 Here I could look back down the Eidart to the hills on the far side of the Feshie and up the eastern of the three feeder streams, the Allt Luineag to cloud-capped Cairn Toul. Ahead of me lay the gentle undulating Moine Mhor. 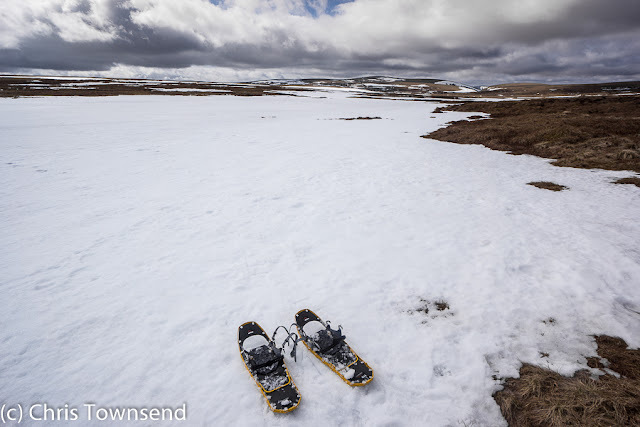 There was less snow remaining than I had hoped for up here but the now shallow course of the Caochan Dubh was still unbroken white and I was finally able to don the snowshoes I was carrying for a few kilometres. As I neared the northern end of the snow and the end of the now hidden Caochan Dubh I saw a figure on the track that runs along the ridge above, the first person I’d seen since setting out the day before. Reaching the path that leads back to Glen Feshie I stopped to remove the snowshoes. 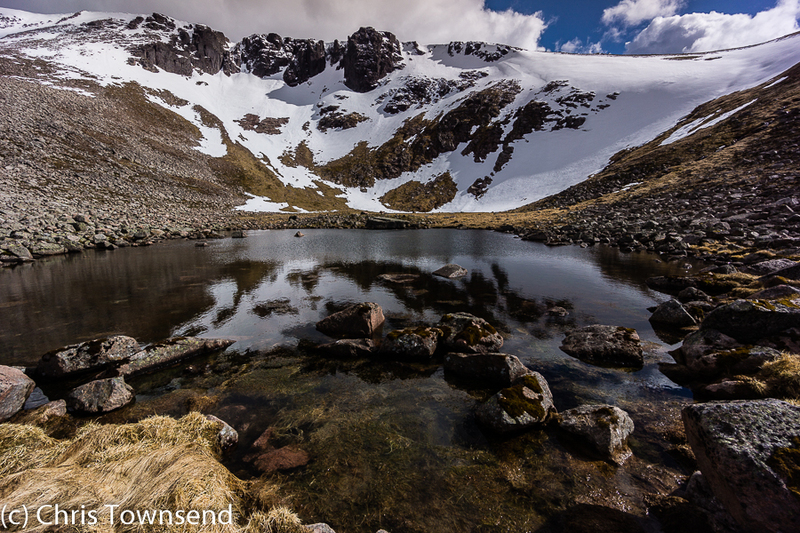 The walker came across the snow and I recognised multi-Munroist Hazel Strachan. 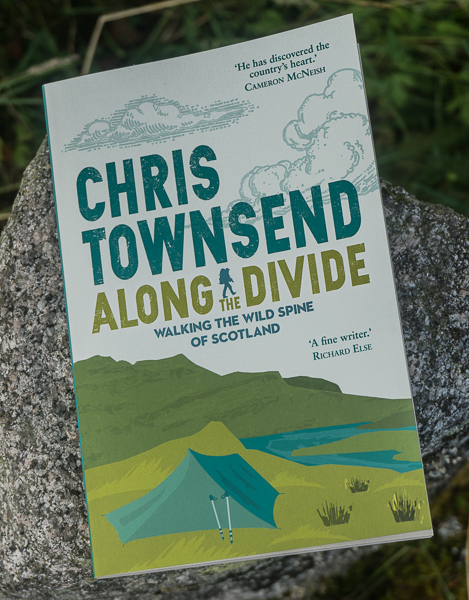 She’d just done a walk round the seven Munros in the area, with a bivvy on the slopes of one, and was now heading back to Glen Feshie. Standing there in the midst of the huge expanse of the Moine Mhor we talked of the mountains, the weather, the snow, boots, waterproof socks and more then Hazel was off speeding up the path at a faster rate than I could manage while I packed away the snowshoes before following rather more slowly. The clouds had slowly lifted during the day though a bitter wind nullified any warmth from the sun. The light was sharp though and the views west to Ben Alder, Ben Nevis, Creag Meagaidh and more from the descent were excellent. 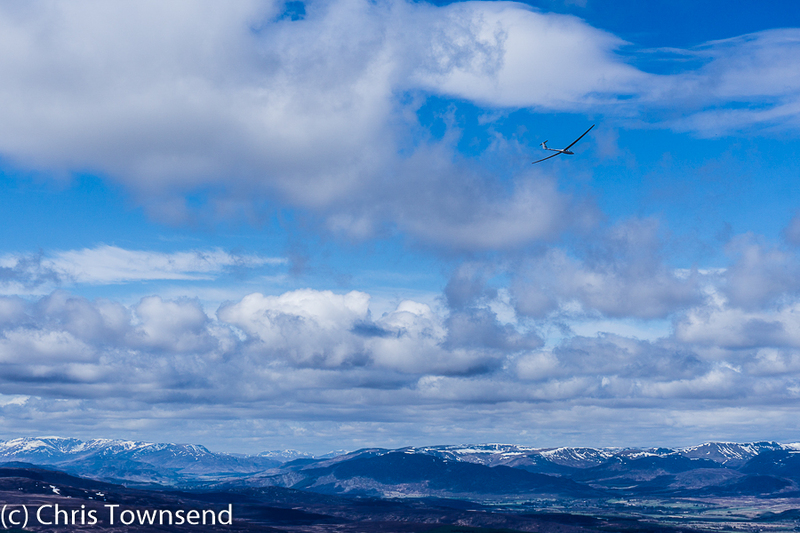 I was also entertained by a glider swooping silently over the slopes. Then it was dry shoes and socks and Aviemore for a late lunch after what had been an excellent trip. A rush of air. I looked up. A raven. Flying low some fifty metres away. The bird turned effortlessly and flew back past me, having a good look. Ravens are curious birds and know that people often leave tasty scraps of food. Later I heard it's harsh 'crark' cutting through the windy air, one of the thrilling sounds of the mountains. 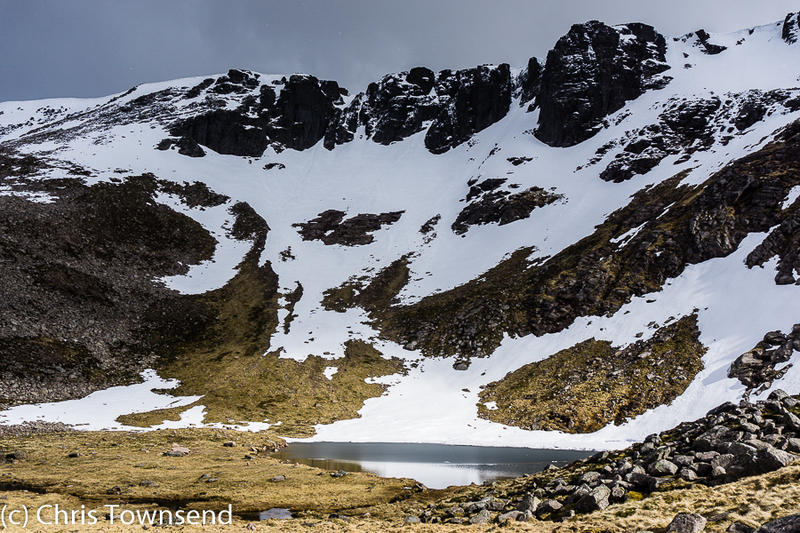 I was on the vast plateau of the Moine Mhor in the Cairngorms just two days ago when I encountered that raven. I returned home to learn that Scottish Natural Heritage (SNH) had issued a licence for a five-year mass cull of ravens in an area of Perthshire noted for wildlife crime. This is appalling and has led to an outcry, as it should. It's been covered thoroughly by Raptor Persecution UK and the RSPB has said it is outraged. There are two petitions to sign - one on the Petition Site and one on Change.org. More importantly letters of objection can be sent to Mike Cantlay, SNH Chair, calling on him to withdraw the licence with immediate effect. 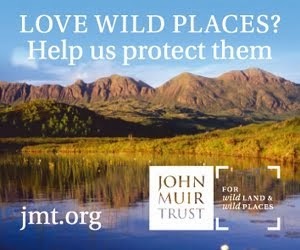 Emails to: chair@snh.gov.uk. There seems to me no justification for this slaughter. It's noteworthy that SNH worked with gamekeepers, farmers and estates on this but no wildlife or bird organisations. 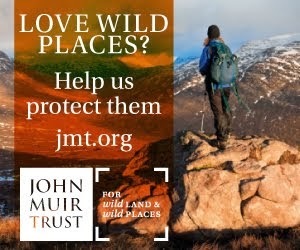 Not the RSPB, or the Scottish Raptors Study Group, not the Scottish Wildlife Trust - no-one in fact who might have argued against the proposal. The killing of birds of prey to protect other birds so they can be shot always sickens me. 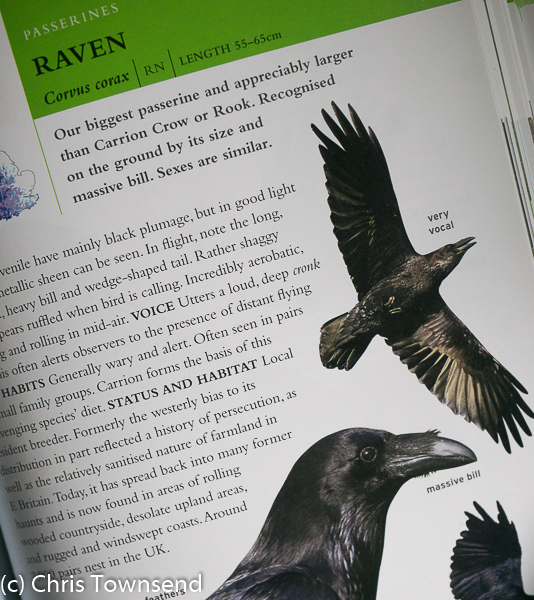 This proposal has upset and angered me more than most as ravens are a favourite of mine. One of the symbols of wild places their harsh cries always inspire me. They are brilliant fliers and I love watching them and find their behaviour fascinating. They are very curious and often unwary around people. Sit and watch and they'll perform superb aerobatics as they keep an eye on you in return. Look back and you'll often see them land where you've been sitting, hoping to find something edible. Ravens are found in wild areas worldwide. I've seen them everywhere from the deserts of Arizona where I startled a flock of them feeding on a dead cow and Makalu base camp high in the Himalaya where another flock was enjoying teasing a dog. The last case showed just how much ravens like having fun and how clever they are. The dog had tagged along with us for several days, feeding on scraps chucked to it by the kitchen crew. At base camp I was sitting on a rock watching some ravens picking about on the ground when the dog suddenly appeared and ran at the ravens, which flew up in the air cackling loudly. They didn't just fly off though. Instead they settled on a boulder and watched the dog. Then one of them flew down onto the ground near the dog and turned its back to it. The dog duly charged the raven which flew off to the sound of loud cackling from the other ravens. Another raven then repeated the performance. Then another. The ravens were clearly finding the poor dog very entertaining. 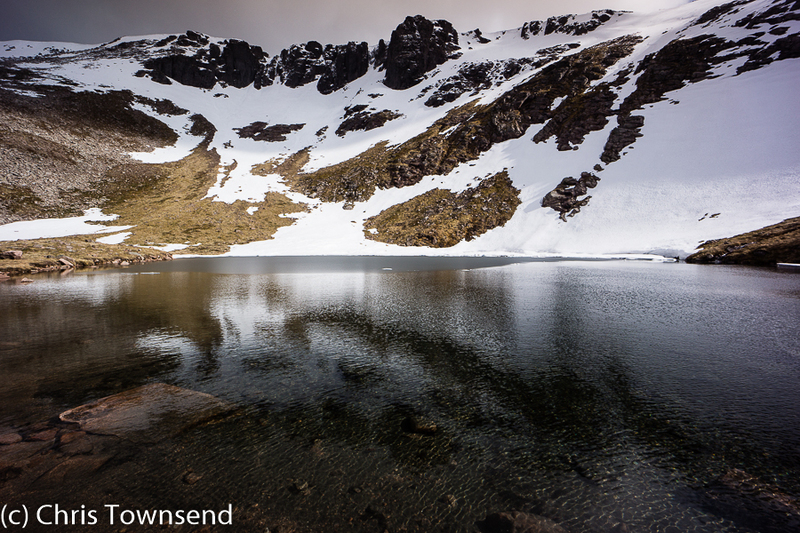 In Scotland many mountain features are named for the raven. There's a Creag an Fhithich (rock of the raven) on Ben Lawers, a Biod an Fhithich (pointed top of the raven) in Kintail and an Eas an Fhithich (waterfall of the raven) in Strathglass plus many more. It was and is an important bird of mountains and wild places. It should remain so, unpersecuted.